I will eventually get to my predictions for 2014 but in the mean time we still have a few questions left from my survey. What new routes do you think Plymouth Citybus will introduce in 2014? Possibly a full run to Mount Batten to finish First off. A cross-city service from Southway to Mount Batten. I suspect on other City route will be one to Mountbateen/Hooe etc to rival Firsts number 2. Service 7: Mount Batton > Hooe > Radford > Mount Batton Way > Broadway (Fire Station) > Pomplett > Laira Bridge > City Centre > Mutley > Crownhill > Derriford > Southway Every 15 minutes There are not too many areas where First is still dominant, but Mount Batten is an obvious one to try to get Plymstock all to themselves. Mount Batten is the most popular suggestion by some distance. The Kingsbridge / Dartmouth corridor is another popular suggestion, but equally a few suggest there would not be enough custom to make it worth while. Dependant on tender wins, possibly a Plymouth - Cawsand/Millbrook/Cremyll route. New tenders start for this route in April 2014, and PCB appear to be sticking round for now to see if they can win it, and hence haven't 'yet' given in despite poor loadings. Callington to Plymouth, creating more cross city routes. Taking over the Park and Ride if First do pull out. More cross-city routes, though most of the East-West routes are already covered. If Torpoint proves successful, they might want to have a go at Millbrook/Cremyll - or even take over the Torpoint depot. I don't think they will try Callington as Western Greyhound are quite capable of seeing First off here. Go Ahead and Stagecoach work well together in other cities such as Oxford, Newcastle and Brighton - so could be interesting. Citybus could pick up the Callington route and Rame penisula. Plymouth to Callington or Plymouth to Liskeard via Antony, Sheviock,St Germans & Tideford. Again. there are lots of suggestions for Cornwall, with quite a few against such a move or querying if its really worth while. I think the key phrase is – tenders – Many expect Citybus to gain work in both Devon & Cornwall through council tenders. 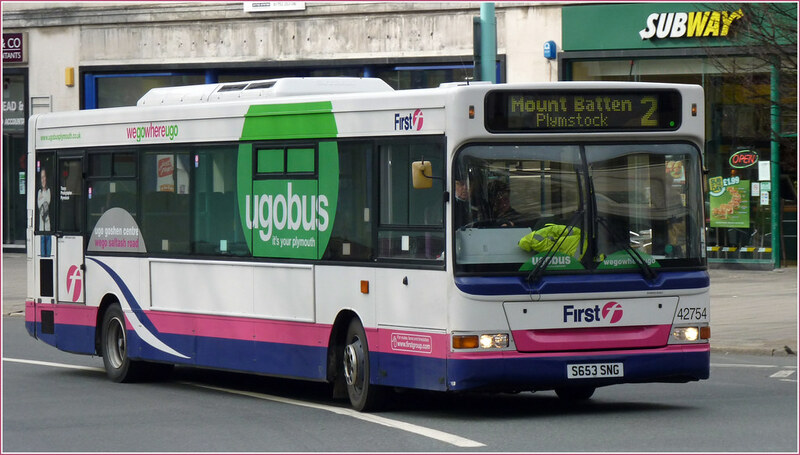 I think City Bus should look next at Plymouth Exeter as that corridor us under served and abused by Stagecoach the time table is poor. Also think Park and Rides might be given up by First if Plymouth operations begin to loose even more money. There were a couple of suggestions of Exeter, although outweighed by others suggestion it would not be a good move against Stagecoach. A new, revised 46 and 47 bus service through Devonport, St Budeaux, Ernesettle, Whitleigh, Southway, Derriford Hospital, Estover, Leigham, Thornbury, Mainstone, Efford, Lower Compton, Mutley Plain and City Centre (47 the reverse of this route). A surprising one (to me at least) we had a couple suggestions for the return of the City Circle routes. It has been an interesting exercise for me to see if other readers share some of my views. Its nice to know that others see things in a similar vein! Will First still have Mountbatten to themselves in 2014? Many of you think not! "Go Ahead and Stagecoach work well together in other cities such as Oxford, Newcastle and Brighton"
Yes, in Newcastle Stagecoach, Go-Ahead and Arriva operate a cartel. This came to the notice the year before last when the Competition Commission unearthed commercially sensitive emails circulating between Go-Ahead and Arriva. Having discovered the existence of these emails, the commercial director at Arriva was swiftly removed from his post as was the managing director at Go North East. No wonder Nexus (TWPTE) want to introduce Quality Contracts and in this respect, I support them 100%. These companies have never competed with each other to any great extent resulting in private monopolies sharing a £64 million plus subsidy from the taxpayer, and setting the fares and the timetables as they choose. This was certainly not in the spirit of deregulation and it shouldn't be allowed to continue! Bus companies are in business solely to make a profit for their shareholders who have put up the cash to enable them to exist in the first place. How they achieve this will depend on what sort of customer base they have. If there is little chance of persuading more people to buy bus rides (as in rural areas) competition will simply make both operators unprofitable and they will fail. In busy urban areas, competition most likely means that both companies will see their profits reduced. The effect of "Quality Contracts" is, by definition, to reduce profits which is why First have pulled out of London and why Stagecoach sold to McQuarrie. McQuarrie couldn't make a go of it so Uncle Brian bough back a a bargain price which restored some financial viabilty. There is very little evidence that competition works in the log term.